Albufeira is Algarve-central and not just geographically. This attractive, medium-sized town by the sea is where the tourists flock in summer. For home buyers it’s a medium-priced market with real year-round appeal and great rental potential. Albufeira, in the centre of Portugal’s Algarve, has been a tourist hotspot since the 1960s. In common with many resorts in Portugal, the population swells in the summer, from 40,000 year-round to around 300,000 in the peak months. The reason Albufeira is so well-established quickly becomes clear as soon as you set foot on one of the area’s golden cove beaches. Whether you visit the town’s main “Fishermen’s Beach” or one of the several others within easy reach, you’ll find picture-postcard seascapes and warm sun for much of the year. The area’s popularity means this is a place where there are job and business opportunities for English speakers. We can put you in touch with a trusted estate agent, Portuguese lawyer and currency specialist. Albufeira is broadly split into two parts – the Old Town and “the strip.” The strip is a long road that spans the areas of Montechoro and Areias de São João. There’s no getting away from the fact that this is “tourist-central,” a popular destination that’s loud, brash and lively. Menus in English and German are more prominent than those in Portuguese, and while it’s not on the level of Magaluf or Bulgaria’s Sunny Beach, it won’t appeal to everyone. The flipside is that the area’s popularity means it is a place where there are job and business opportunities (at least in the summer) for English speakers. In addition, expats who do wish to live among people from their former countries will definitely find them here. It’s also important to remember that the stunning scenery that made this area so popular is right on the doorstep. 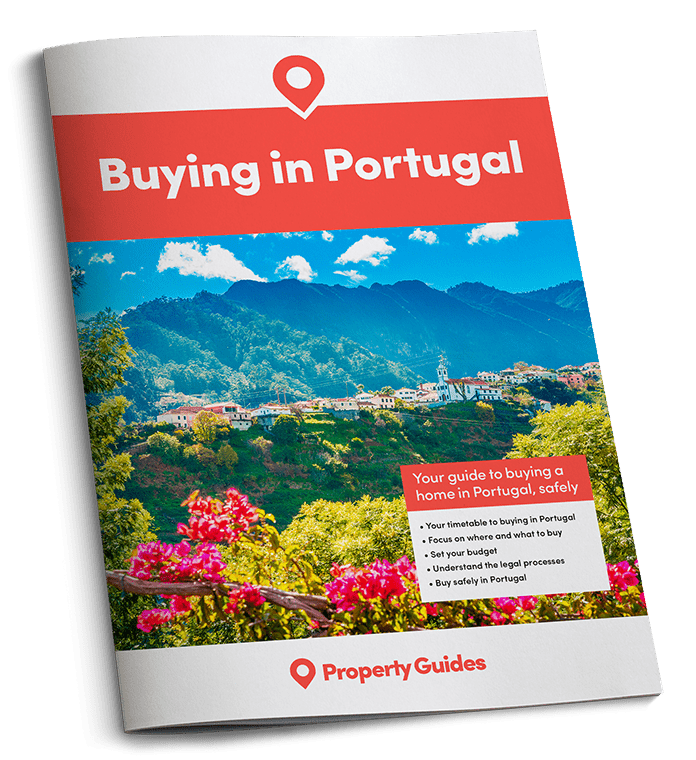 If you are ready to buy in Portugal in the next three months, call our friendly Portugal Resource Team on 020 7898 0549 or email info@propertyguides.com. 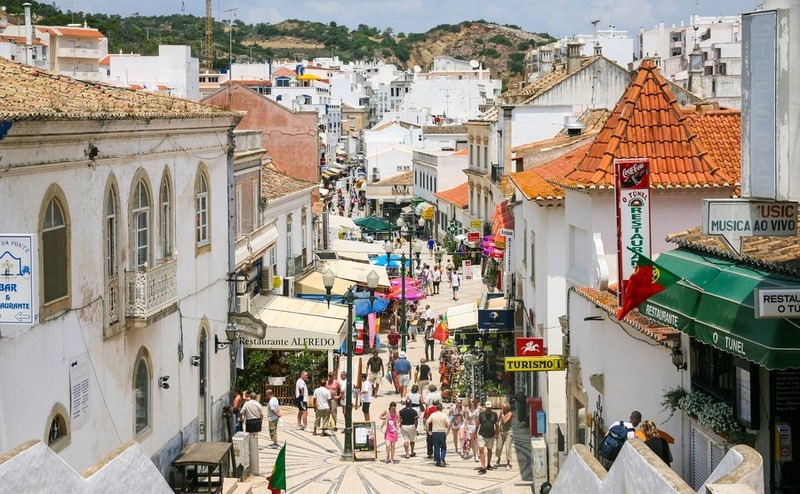 Albufeira’s cobbled Old Town is still hectic in summer, but is a rather different proposition. While still very much a tourist resort, this area retains some authenticity and charm. Yes, there are still British bars and souvenir shops, but there are also good quality Portuguese restaurants and quirky little bars. Albufeira’s long-standing popularity means that the area is blessed with superb amenities of all kinds. Nearby Guia is a commercial hub with shopping malls, DIY stores and garden centres in abundance. It is also the birthplace of that fine Portuguese export, piri piri chicken. The Algarve’s main theme parks and tourist attractions are nearby too. Property everywhere in Portugal is rising in value right now with record tourism levels and the rising economy encouraging both local and international demand, particularly in areas such as Albufeira. Albufeira offers that dream escape for British retirees – shelter from the British winter for six months then rent it out for profit all summer. Living in the Albufeira area doesn’t necessarily mean living by the strip or the Old Town. Villages on the outskirts of the area offer a rural choice that’s still in reach of the facilities. Alternatively, for those who really want to be “in the thick of it,” Albufeira certainly offers that. This isn’t unspoiled Portugal – but it’s still an area with loads to offer. Prices for two-bedroom apartments in Albufeira start at around €125,000, with townhouses from €200,000 and villas with pools at around €300,000. With its year-round facilities and huge summer tourist market, property in Albufeira offers that dream escape for British retirees – shelter from the British winter for six months then rent it out for profit all summer. Albufeira is just a 40 kilometre drive from Faro Airport, which has year-round flights to most major UK airports. The drive takes around 40 minutes on the Algarve’s good roads. Unfortunately, there is no train service to central Albufeira, the railway station is several kilometres out of town.